Park’s Best of the Fest | FUJIROCK EXPRESS '18 ENG Ver. | STRAIGHT OUTTA NAEBA! While many weren’t happy with the decision, this year’s festival put a lot of it’s cards on bringing big-name acts which lied on the outskirts of what most would refer to as “rock”, with hip-hop music getting a big chance to shine. Though previous years lineups included such big name acts as OutKast and Kanye West (who eventually cancelled), this was the first year that the festival really opened up to the genre, placing at least five world-famous acts on big stages and either reflecting or influencing how hip-hop music is viewed in modern Japan. While some major hip-hop acts fell a bit short of their challenge this year, two of them really managed to stand out for me, along with a couple other non-hip-hop performances which will continue to be engrained in my memory for years to come. 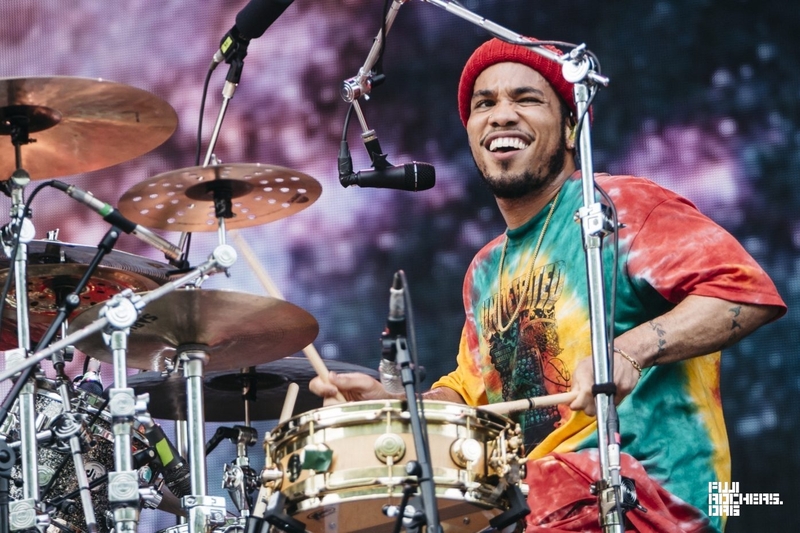 Taking the stage with a huge smile on his face, the smile never once faded as Anderson .Paak and his talented band, The Free Nationals, completely rocked Sunday afternoon with their incredible performance. Not only an impressive frontman and rapper, the dude can jump behind a drum set and work pure magic. Fast moving clouds brought periods of sun and rain that would echo the rollercoaster ride of his fast paced but funky performance. After making big waves at Fujirock last year on the Rookie stage, “neo-kawaii” girl group CHAI were given a primetime slot on the Red Marquee and blew everyone away once again. While musically not much has changed since their last go at the festival a year ago, they definitely stepped up their game to reach a larger audience, and they made it seem like even the Red Marquee was too small a stage for their energetic performance. The set that I was most anticipating since the first announcement of this year’s lineup, Kendrick Lamar’s rich storytelling definitely lived up to the hype. Though any elements of a backing band were downplayed, Lamar’s huge personality shown forth and the setlist was as strong as any Kendrick fan could hope for. The timing of his appearance at this year’s festival was a perfect chance to catch the man at the height of his career and witness firsthand the major influence he has on not only hip-hop music but world culture. A band that I wasn’t familiar with prior to this year’s festival, neconemuru made a huge impact with their stong musicianship, upbeat and complex song structures, and ability to make catchy pop music without the use of vocals. Like a diving board to jump into this year’s festivities, they made a huge splash playing early Friday on the Red Marquee and I will definitely be keeping an eye on this young Osaka band to catch future performances. Fujirock putting an electronic music performer on a main stage is nothing new, but I feel like Skrillex is really a dividing artist in terms of the ages and tastes of festival goers, particularly at one like Fuji Rock. Yet by injecting all kinds of past and current iconic influences, he may have initially alienated but eventually won over a whole new crowd of die-hard straight-up rock fans who just plant their chairs at the far back of the Green stage.